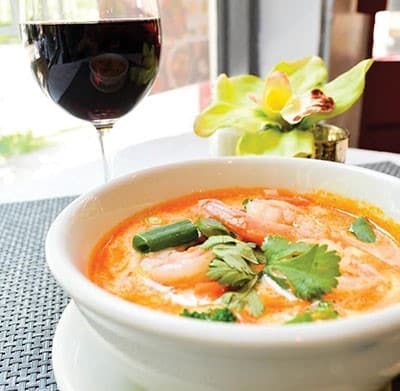 If you like Thai cuisine, you’ll love PJ’s Thai Corner, a popular foodie destination located at the corner of Abercorn Street and Oglethorpe Avenue in the heart of downtown Savannah. Since 2011, PJ’s Thai Corner has been serving fresh, authentic Thai dishes made from scratch. 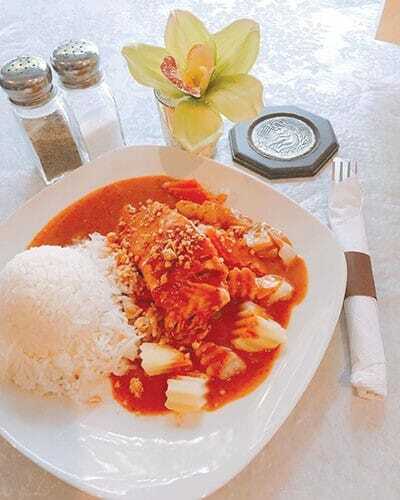 Popular items include the Crispy Lime Chicken, prepared with a homemade chili paste, and the new Thai Basil Rolls, served with a homemade peanut sauce. PJ’s Thai Corner appeals to locals, as well as visitors, and earns rave reviews on TripAdvisor, Yelp and Zomato. Over the years, this beloved Thai restaurant has even attracted a few celebrities, like actor Adam Sandler, actress Zoe Saldana and rap artist Childish Gambino. “They love our food,” said Healy, who worked in the hotel industry in Thailand for 10 years before moving to Savannah. PJ’s Corner serves lunch and dinner Monday through Saturday. Start any meal with Tom Kah, a hot and sour coconut milk-based soup, or Tom Yum, a spicy lemongrass soup. Favorite appetizers include grilled pork dumplings, grilled chicken satay marinated in coconut milk and vegetarian spring rolls. Don’t miss signature dishes like deep-fried Bangkok Chicken, served with garlic, cilantro and vegetables, as well as a wide range of curry entrées, from Panang Curry to Massaman Curry. All entrées are served with steamed white rice, with upgrades available for brown rice or egg fried rice. Popular vegetarian entrée selections like Japanese Eggplant Ginger in Black Bean Sauce and Summer Cashew with homemade chili sauce and mixed vegetables delight vegetarian diners. Gluten-free options are also available. Chicken wings are a specialty at PJ’s Thai Corner. Try the marinated wings with a sweet Tamarind Vinaigrette, a spicy Homemade Peanut sauce or an extra hot Spicy Sauce. On a hot summer day, cool down with a refreshing Thai Iced Tea or Thai Iced Coffee. Fountain drinks, beer and wine are also available. Enjoy fresh food and friendly service in a casual atmosphere at PJ’s Thai Corner. Savor a taste of Bangkok in Savannah! PH’s Thai Corner, located at 147 Abercorn St., is open Mon.-Thurs. 11 a.m.-3:30 p.m. and 4:30-8 p.m.; Fri. 11 a.m.-3:30 p.m. and 4:30-9 p.m.; and Sat. noon-3:30 p.m. and 4:30-9 p.m. For more information, call (912) 201-3534 or visit Facebook.com/PJsThai.